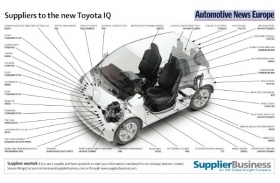 NSK Ltd. helped make the Toyota iQ as compact as possible by supplying the minicar's column-mounted electric power steering. In addition to preventing oversteering and understeering, the design enables a turning circle of less than 4 meters. Furthermore, the compact design of the electric power steering allows the knee airbag to be packaged closer to the driver's knees, thereby reducing deployment time and hence minimizing injury following a collision. Denso Corp. supplies the iQ's space-saving air conditioning unit, which is about one-fifth smaller than the previous design, yet gives the same level of performance. The use of new resin molding technologies was key to the design, allowing the unit's blower fan to be approximately halved in size. In addition, air passages were re-directed and more compact air filters were used to reduce the unit's volume. An advantage of the smaller size is that passenger-side dashboard could be moved toward the windscreen, resulting in more interior space. Gentex Corp. provides an auto-dimming interior mirror, which darkens in response to headlamp glare emitted by vehicles approaching from behind. The feature comes as a standard fit on the iQ's top trim level. Toyota launched the Toyota iQ at the 2008 Paris auto show. At less than 3000mm in length, the minicar is designed for modern urban driving. The vehicle comes with a choice two trim levels and three engine options: 1.0- and 1.3-liter gasoline powerplants and a 1.4-liter diesel. The 1.0-liter gasoline engine is the most fuel efficient of the three, emitting 99 grams of CO2 per kilometer. To put this in perspective, Smart's two-seat minicar, the ForTwo, when equipped with a hybrid drive has a CO2 emissions rating of 103g/km. Toyota began production of the iQ in November 2008 at its plant in Takaoka, Japan. The car went on sale in Japan that month while Europe sales started in early 2009. Prices begin at 12,900 euros ($15,960) in Germany.